SITE: Barcelona is a spectacular city in which to study and live. 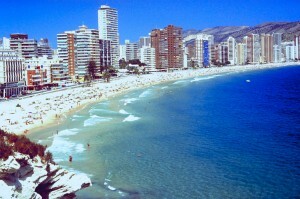 It is one of the most cosmopolitan cities in Europe and by far the most modern city in Spain. Situated on the Mediterranean, it is a city of contrasts; mixing the best of old and new, traditional and trendy, religious and secular, conservative and progressive. As such, this vibrant city offers students the unique opportunity to both surround themselves with Spanish language and tradition while at the same time taking advantage of its mixture of Spanish and Catalan cultures. With Barcelonians fluent in both languages, students have the opportunity to perfect their Spanish while also learning some Catalan! People in Spain are passionate fans of football (soccer), delicious food, family, and celebrating and enjoying life to its fullest. Festivals and holidays are important in Spanish life, and have their own distinctive flavor depending on local customs and the time of year. We hope you enjoy your stay in Barcelona and have a chance to explore and take advantage of all its spectacular offerings! CLASSROOM: Classes will be held at the facilities of International House and the Barcelona School for International Studies (SIS). The school is located in the city center, just steps from Plaça Urquinaona, 5 minutes from Plaça Catalunya, and 5 minutes from the Arc de Triomf. With easy access to many bus lines and several metro lines, it is easy to get to classes from anywhere in the city. STUDENT FACILITIES: Wi-fi is available throughout the school and students (and faculty) also have access to computers and a printer. To make photocopies, there is a copy shop just across the street. The building also has a sun-drenched terrace to study, eat, or just hang out. TRANSPORTATION: An unlimited 3-month public transportation pass is provided for all students on this program. The pass is good for the metro, bus, train & trams within Barcelona city and near surroundings. COURSES: Students register for their courses at the home campus. See your study abroad adviser for course offering. – Spanish (5 credits) is required for all students. ENGL&236 Creative Writing I: “The Ten-Week Travelogue” is a great way for students to record and process their experiences abroad. It’s also a great introduction for students with no prior exposure to creative writing. ENGL& 254 World Literature I : “Fantastic Spain” (Science Fiction & Fantasy at Clark) would fall under that analysis category, stressing the skills of close reading and interpretation. This is an academic program and students are expected to enroll in a full-time course load. Failure to participate in the academic coursework may result in dismissal from the program. Students are encouraged to make the most of their classroom learning as it will enhance understanding of all the local area has to offer. HOUSING: Students will stay in homestays in double rooms. A homestay can be one part of a meaningful cultural integration and increased safety of the study abroad experience. Homestays are designed to be a mutually valuable experience for both the hosts and the participant. We work to find homestays that want to share their culture and language with the students and create a warm and welcoming atmosphere. A homestay “family” does not always mean a husband and wife, two children and a cute dog. In fact, what is more common is to live in the apartment of an older, widowed woman who enjoys the company. The thorough screening process, regular family check-ins and homestay reviews allow us to monitor safety and the quality of the homestays we place our students with. Homestays include breakfast and dinner every day, laundry services once a week, a set of keys to the apartment to come and go as you please. WCCCSA Barcelona participants are all eligible to apply for the $1,000 WCCCSA scholarship. Send completed application form and all supporting documents to Ulli Schraml at uschraml@whatcom.ctc.edu Specific due date for the scholarship application is posted on WCCCSA.org website. This scholarship is open to all students who have processed program desposit to the WCCCSA Barcelona Fall 2019 program.